Tensions arise between Will and Finn on Glee as they face off about Finn kissing Emma. Artie, Tina, and Blaine force them to sing a musical duel. 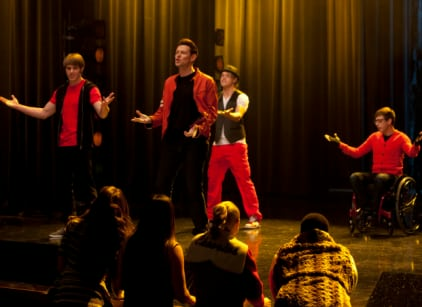 Sue forces Blaine to rejoin the Cheerios after they perform a Mariah Carey/Nicki Minaj themed mash-up. Ryder, Jake, Marley, Wade/Unique, and Kitty bond as the new class and Marley helps Finn figure out what he wants to do with his life. Santana goes to the doctor with Rachel where Rachel learns her pregnancy was a false alarm. Rachel and Kurt later ask Santana to move out after Santana confronts Brody at NYADA. Blaine: I'm not rejoining the Cheerios. Sue: Oh you most certainly are. Or something unfortunate will most likely be happening to you extremely soon. Rachel, you can't just blow past this like nothing ever happened. This is a wake-up call. This is an opportunity for you to take a hard look at the choices that you're making, where your life is heading. Glee Track List: Boy Bands Collide!